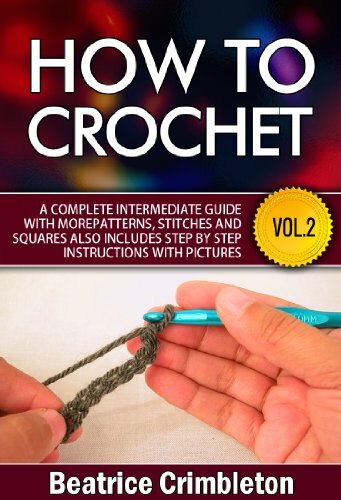 Download the Follow up to the Best Seller “How to Crochet Vol. 1 For Beginners.” Build upon What you Learned in the First book or Give this a Read if you don’t need to start with the Basics. One of the Most Comprehensive Crochet books to Help Expand Your Skillset and Crochet with More Advanced Patterns and Stitches, with Tons of Pictures and Detail Diagrams! Also with a bonus chapter "Charities in Need of Your Talent and Places to Sell Your Finished Work." you cannot miss out on!! In this intermediate guide, we will build upon the techniques and essentials used in How to Crochet: Volume One. With more advanced stitches and patterns, you can begin to explore the further intricacies of a popular craft and art. I will walk you through some of the intermediate techniques that can be used to create breath-taking projects. I will also include some specialty methods that might spark your creativity and imagination. Take whatever you can to make your work beautiful and unique. This book will help you build upon the basic skills of crocheting. Since you already know how to chain, single crochet, half double crochet, double crochet, and treble crochet, you are ready to learn new patterns that will combine these stitches to make beautiful and fun designs. If you’re interested in furthering your skills at the art of crocheting, I encourage you to read this book and try some new and exciting techniques! And a tiny sample of what you will find inside. Intermediate Stitches Specialty Stitches Specialty Crochet MethodsThe Popcorn StitchThe Star StitchThe Pineapple Stitch The Hairpin and Broomstick Lace Specialty Yarn And a Bonus chapter on How and Where to Sell your WorksAnd, much, much more!